According to a recent market report by Transparency Market Research, titled “First Aid Kit Packaging Market: Global Industry Analysis, 2013–2018 & Opportunity Assessment, 2019–2027,” increasing adoption of first aid kit packaging in the automotive industry and compliance for first aid kits in workplace are projected to accelerate the demand for the first aid kit packaging market across the globe during 2019-2027. The revenue generated by the global first aid kit packaging market has been projected to be around US$ 282.6 Mn in 2019 and is anticipated to grow at a CAGR of 4.0% in terms of market value during 2019-2027. From the 19th century, boxes or cases have been a popular choice for first aid kit packaging owing to their durability, convenience, and spaciousness. Boxes or cases are still popular among manufacturers for first aid kit packaging as compared to bags or pouches. The United States-based health care solutions provider, 19Labs, developed a smart first aid kit packaging box or briefcase in 2016. 19Lab’s first aid kit packaging box has a touch screen panel inside the cover that helps access instructions and multiple compartments that can easily organize medical supplies. The use of bags and backpacks for adventures, sports, and military first aid kit packaging is increasing due to their flexibility and heavy load carrying capacity. Textile fabric is estimated to witness fast-paced growth in the global first aid kit packaging market owing to the increase in demand for bags and backpacks. More than half of the backpacks were sold in North American and European first aid kit packaging markets in 2017 owing to an increase in demand from millennials. In the United States, Occupational Safety and Health Administration (OSHA) and American National Standards Institute (ANSI) standardize the first aid kit packaging for offices and industrial areas in terms of the number of persons treated, portability, and quick accessibility to first aid products. In first aid kit packaging, the boxes and cabinets manufactured by plastic and metal are designed per the OSHA and ANSI standards. Chinese and Indian administrations have set regulations for safety, health, and environment at the workplace, which are anticipated to boost the demand for workplace first aid kit packaging during 2019-2027. The increased awareness about health and the need for immediate treatment in case of uncertainties at workplace are the key drivers fuelling the first aid kit packaging market. In the global first aid kit packaging market report, manufacturers and converters with large manufacturing capacities and known brand names from different geographical regions are profiled. The company description, market and production strategies, product portfolio, company revenue, and segmental revenue of key players in the first aid kit packaging market are evaluated in the competitive landscape. Key players operating in the global first aid kit packaging market include Crownhill Packaging, A2B Plastics Ltd., First Aid Supplies Pte Ltd., The Durham Manufacturing Company, Reliance Medical Ltd., Gaggione, Fieldtex Products Inc. Certified Safety Manufacturing Inc., SYSPAL Ltd, Acme United Corporation (First Aid Only Inc.), Honeywell Industrial Safety USA Inc., Masune First Aid, Inc., Crest Medical Ltd. Cintas Corporation, Lifeline First Aid LLC, and Medline Industries Inc.
At the beginning of 2019, HART Outdoor announced the intention to exhibit new first aid kit packaging for sports and adventures at the 2019 Outdoor Retailer Snow Show in Denver. New first aid kit packaging is a durable nylon bag explicitly designed for rugged outdoor activities. In February 2018, Higher Gear Products® LLC introduced a new product, the Higher Gear Products First Aid Kit which is available on the Amazon Marketplace for sale. The first aid kit packaging pouch is designed as an accessory for home, vehicle, workplace, classroom, outdoor adventures, and vacation travel. In August 2017, the innovative start-up from New York, Mobilize Rescue System, introduced smart first aid kit packaging which is the integration of technology and first aid accessories which prioritize medical emergencies and suggest a treatment process. In the global first aid kit packaging market report, we have analysed specific strategies followed by significant players to sustain in the first aid kit packaging market. The competitive dashboard with the comparative analysis of key players is described in the global report for the first aid kit packaging market. In this report, Transparency Market Research (TMR) offers forecast data for the global first aid kit packaging market during the period 2019-2027. In terms of value, the global first aid kit packaging market is expected to expand at a CAGR of 4.0% during the forecast period. The study reveals the dynamics of the first aid kit packaging market in six geographic segments, along with a market analysis for the current market environment and future scenario as well as opportunities over the forecast period. This Transparency Market Research report studies the global first aid kit packaging market for the period 2013–2027, in which the historical data (2013-2018) and forecast data (2019-2027) are provided. The prime objective of this report is to offer insights and key market trends which influence the growth of global and regional first aid kit packaging. The insights given in the first aid kit packaging market report are presented in a manner which can be useful to take a business decision by analysing the historical and forecasted data. The global first aid kit packaging market report begins with an executive summary in which short information about the market scenario is presented. It is followed by the market dynamics and an overview of the global first aid kit packaging market, which includes market drivers, restraints, opportunities, and trends that are affecting the growth of the first aid kit packaging market. Furthermore, to understand the year-on-year trends of the first aid kit packaging market, a Y-o-Y analysis with elaborated insights is provided. The key players operating in the global first aid kit packaging market are listed down in intensity mapping to show their geographical presence in different regions. The key players include manufacturers, converters, and suppliers of empty boxes, pouches, cabinets, backpacks, and bags used for first aid kit packaging and storage. The value chain for first aid kit packaging is described in the report with a list of prominent raw material suppliers, manufacturers, converters, first aid kit packaging suppliers, and end users. The next section of the report highlights the first aid kit packaging market by region and provides the market outlook for 2019–2027. The study analyses the drivers that influence the regional first aid kit packaging market. The main regions assessed in this report include North America, Latin America, Europe, East Asia, South Asia, and Middle East & Africa (MEA). The report evaluates the present scenario and growth prospects of the regional first aid kit packaging market for 2013–2027. A country-level analysis of the first aid kit packaging market in each region is presented in the report. To ascertain the size of the first aid kit packaging market in terms of value and volume, revenue generated by the key manufacturers and their respective production capacity is taken into consideration. The forecast presented here assesses the total revenue generated by value, across the first aid kit packaging market. In order to provide an accurate forecast, we initiated by sizing up the current market with the help of the parent market. We gathered data from secondary research for the first aid kit packaging market and validated it through primary research. Also, we form the basis of how the first aid kit packaging market is expected to develop in the future by taking into account the opinions of industry experts. Given the characteristics of the first aid kit packaging market, we triangulated the outcome on the basis of three different types of analysis- based on the supply side, downstream industry demand, and economic envelope. Additionally, it is imperative to note that, in an ever-fluctuating global economy, we not only conduct forecasts in terms of CAGR, but also analyse the market based on key parameters to understand the predictability of the first aid kit packaging market and identify the right opportunities across the market. 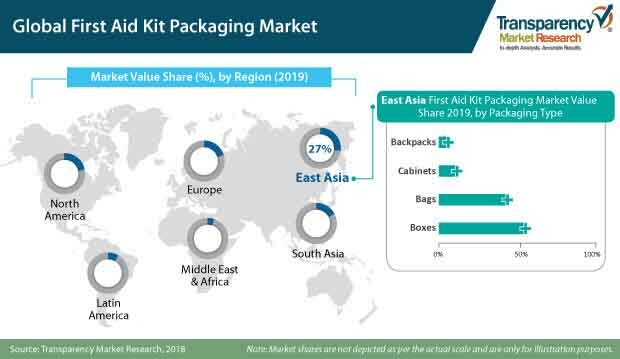 The segments for the global first aid kit packaging market have been analysed in terms of their market share to understand the individual segment’s relative contribution to market growth. This detailed level of information is important for identifying the key trends in the first aid kit packaging market. In the final section of the report on first aid kit packaging, a 'dashboard view' of the companies is provided to compare the current industrial scenario and their contribution to the total first aid kit packaging market. Moreover, it is primarily designed to provide clients with an objective and detailed comparative assessment of key providers specific to a market segment. The report audiences can gain segment-specific first aid kit packaging manufacturer insights to identify and evaluate key competitors based on an in-depth assessment of their capabilities and success in the first aid kit packaging marketplace. Detailed profiles of companies are also included in the global first aid kit packaging market report to evaluate their strategies, key product offerings, and recent developments. The key players operating in the global first aid kit packaging market include Crownhill Packaging, A2B Plastics Ltd., First Aid Supplies Pte Ltd., The Durham Manufacturing Company, Reliance Medical Ltd., Gaggione, Fieldtex Products Inc. Certified Safety Manufacturing Inc., SYSPAL Ltd, Acme United Corporation (First Aid Only Inc.), Honeywell Industrial Safety USA Inc., Masune First Aid, Inc., Crest Medical Ltd. Cintas Corporation, Lifeline First Aid LLC, and Medline Industries Inc.